The Asus Zenbook UX31 Ultrabook in the pictures here was dropped on the floor and stopped working. So I took it apart to triage what was wrong, plus maybe pull out the hard drive and recover some data from it. As a computer professional, I help out friends and family with their computer problems. When a computer won't boot, one of the first things I try is to recover the valuable data through the time honored step of pulling out the hard drive and putting it in an external USB enclosure, then connecting that enclosure to a working computer. This usually takes about 5 minutes, and is a great way to not cause any more damage and see if you can extricate any good data that is left. Since it was invented 20 years ago, the connector inside every laptop, desktop, and most servers in corporate datacenters are "Serial ATA" (SATA). The fact that SATA is so common makes external USB enclosures cost about $3, and they are even reusable! 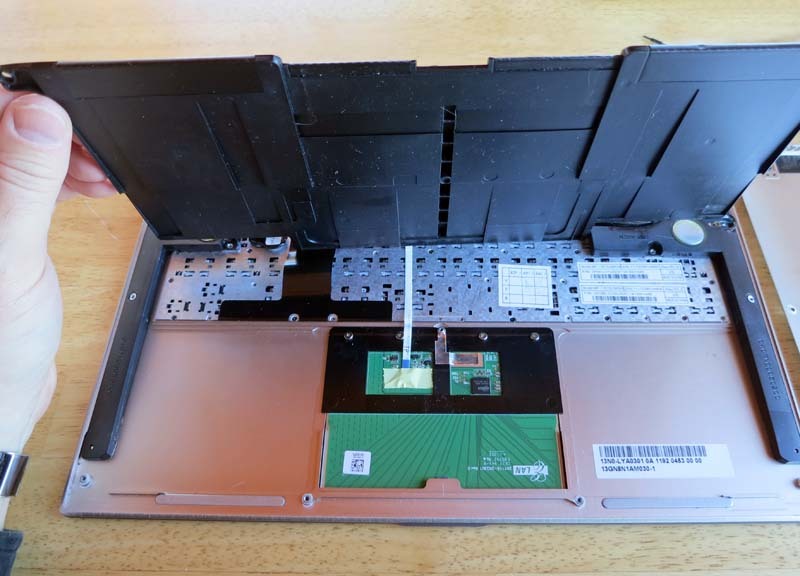 So I was surprised when I opened the brand new Asus Zenbook UX31 Ultrabook and couldn't find the SATA connector I was expecting! 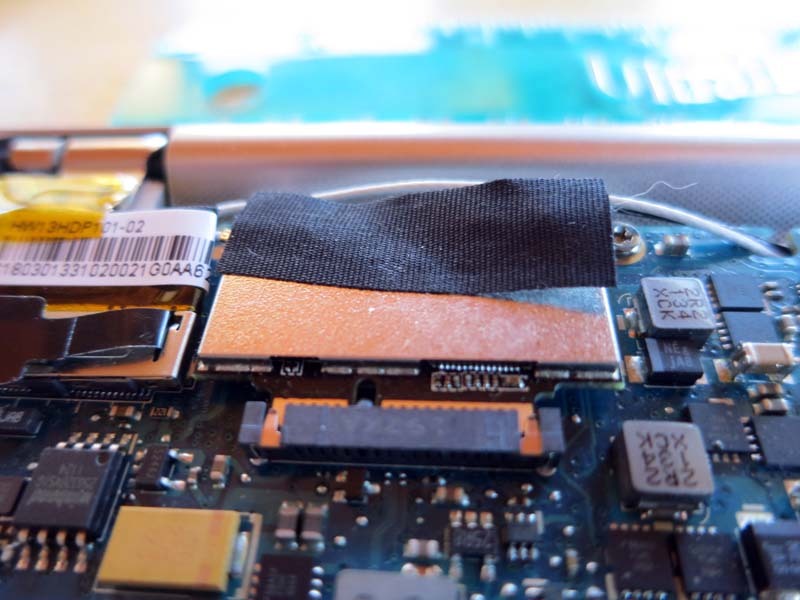 To save space and cost, the SSD drive is just a set of chips on a board mounted on the motherboard by a connector I didn't immediately recognize. 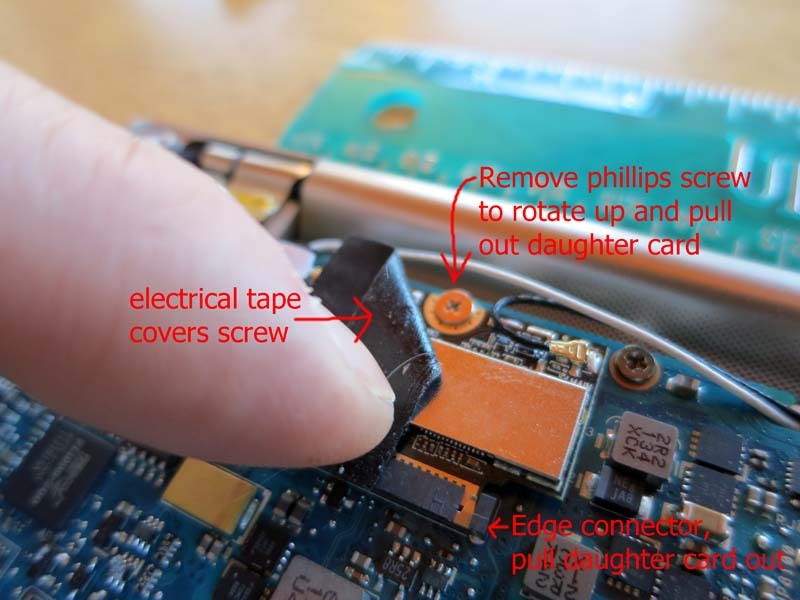 A little Googling and I found this technical page about the SanDisk SSD drive but it wasn't entirely clear which of the available connectors it had, and exactly how I could connect this drive to a separate working computer. I think this is mSATA (?) 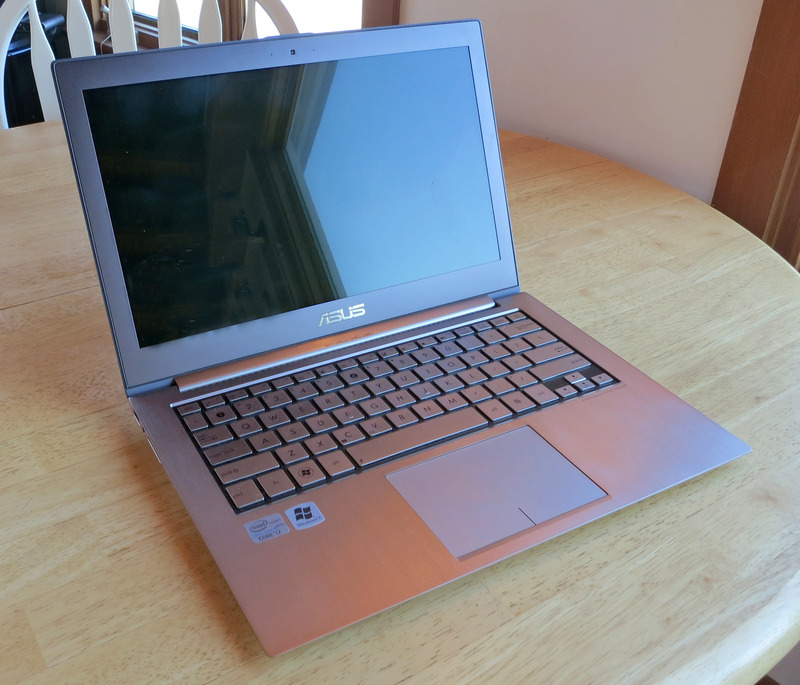 but if you know for sure can you point me at a spec for the ASUS Zenbook that makes that clear? In my opinion, an ideal laptop storage system would be a small, incredibly tough, heat resistant, metal, enclosure. I'm picturing the hardened "black boxes" on commercial airplanes which are designed to survive an airplane crash. The idea is if you drive a car over your laptop and shatter it into thousands of pieces, you can sort through the wreckage and find the data enclosure, brush it off, and plug it into a standard port on another computer to recover your data. Honestly, this wouldn't increase the price of a laptop more than a buck on a $1,000 laptop. 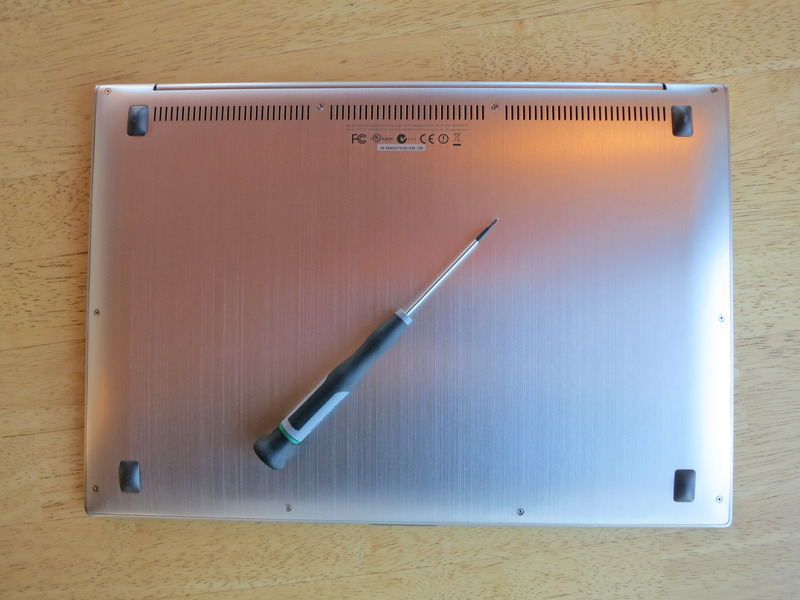 I might be jaded based on my current job, but "dead laptop that won't boot" is the most common outcome for ALL LAPTOPS, followed only by "laptop was stolen". I suppose I've known a few people who upgraded computers because their old computer was too slow, but now that the performance aspects of Moore's law have collapsed (CPUs are no longer getting faster), that won't be happening anymore. To make matters so much worse, only ten short years ago it was hard to lose every family photo you have of your life and your whole record collection at the same time, it only occurred if your house burned down. All it takes now is your leg brushing lightly against the power cord pulling the laptop off your desk. One second every picture of your children from birth through high school graduation is safe, and a moment later they are gone forever. All because ASUS or Apple wanted to make $1 more profit? Is that all your lifetime of memories is worth? Backups are great, but for the 94 percent of people who do not backup their computer, I think those people should be offered the choice of a "survivable memory module" in the computer. I know I would recommend it to friends and family that I cared about. Heck, I always have at least two backups of any data I care about, and I would STILL choose this option. The picture below is of the ASUS UX31 before I started, it is fully assembled. I flipped it over and removed 10 screws with a Torx T5 screwdriver. It turns out the two screws in the center top are longer than the other screws. 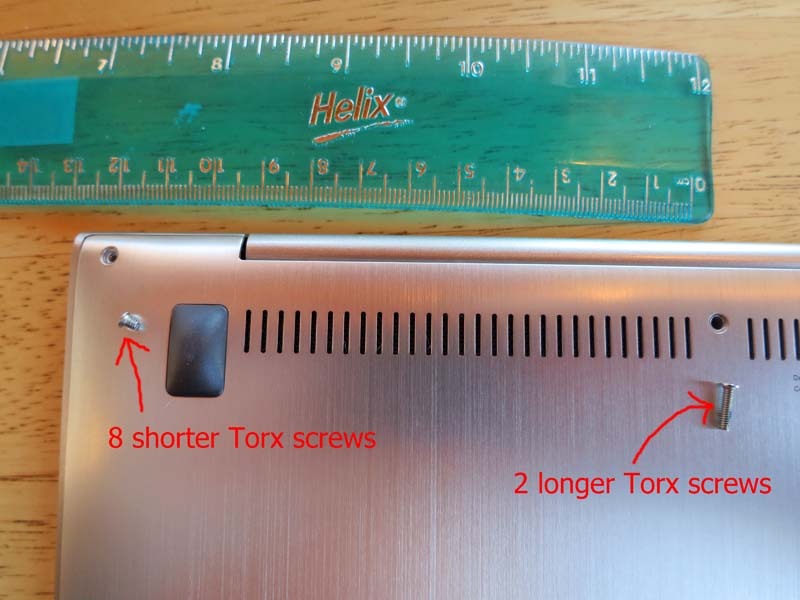 The picture below shows the two separate lengths of Torx T5 screws holding the back in place. The upper left corner is one of the tiny short screws, the ones in the middle top are longer. 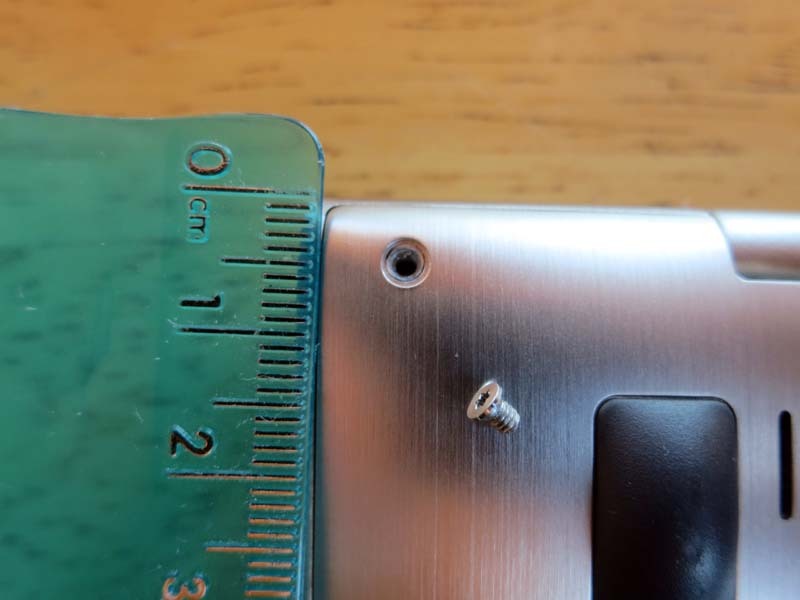 These screws are TINY little buggers, and I don't have any spares, so I'm careful not to lose any of them. Below is a close up picture. 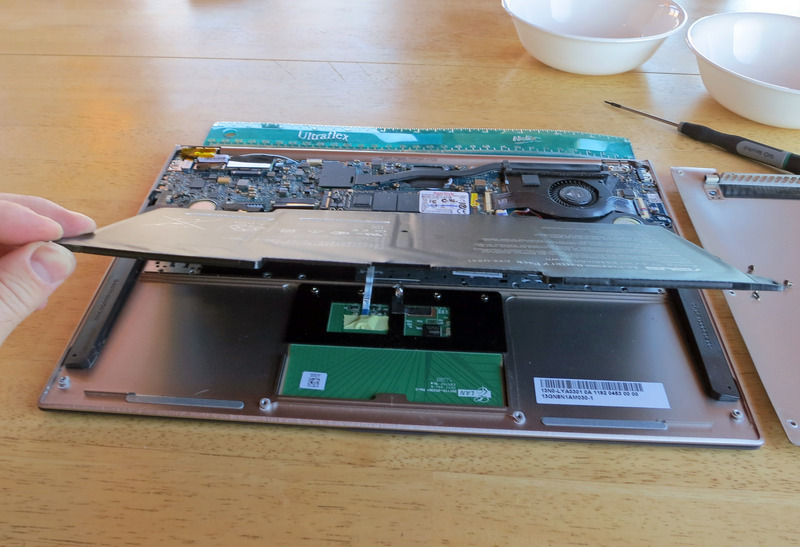 Ok, with the 10 screws removed (placed in the white bowl in the picture below) you can pry the back off the Asus UX31 with your fingernails. DO NOT FORCE IT, it will fall right off if done properly. 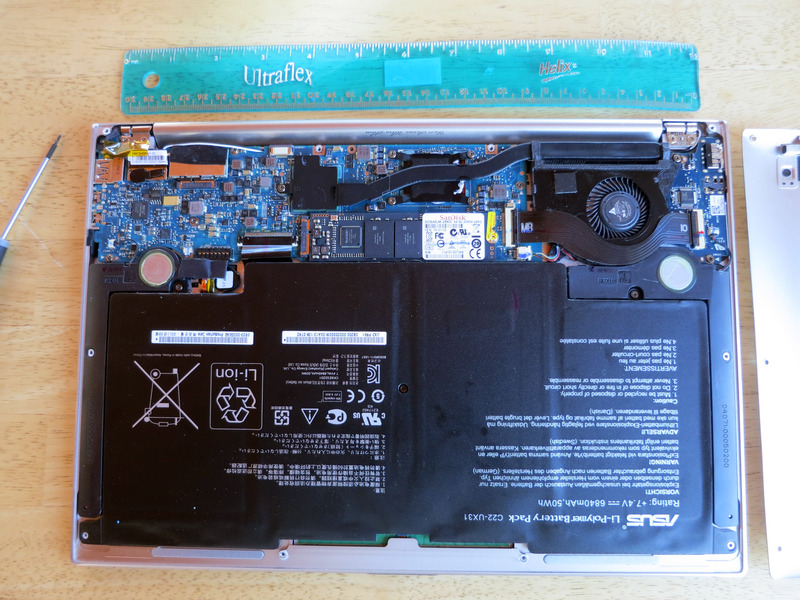 Below is a picture with the back of the ASUS UX31 Zenbook fully removed off to the side so you can see the layout. The big wide black vinyl thing is the battery pack. 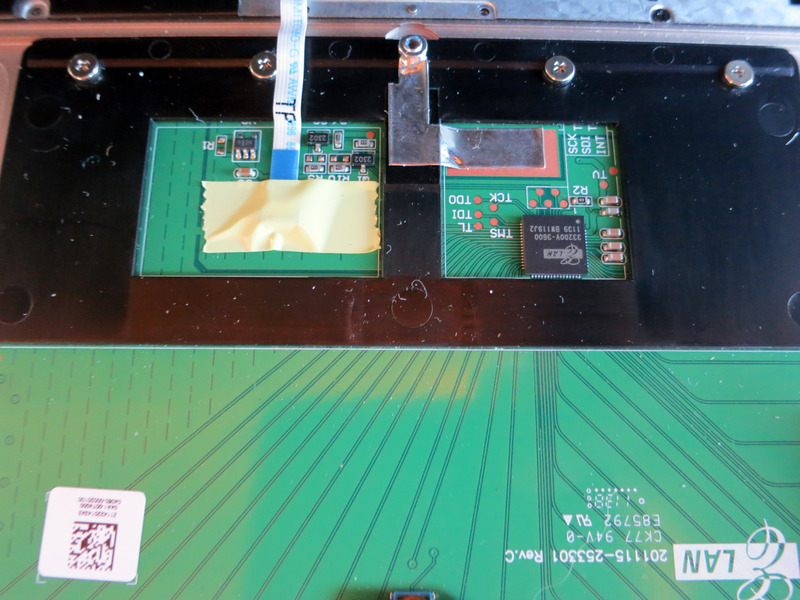 The motherboard runs across the top of the picture and is fairly small (couple inches wide by 13 inches long). 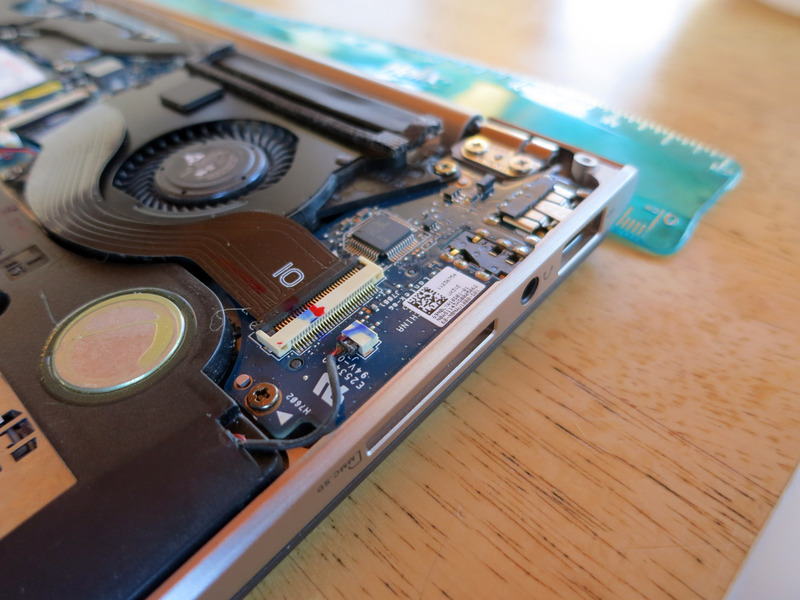 The SSD drive is 256 GBytes and is centered on the motherboard. Here is the battery pack rotated and a close up of the text so you can read it. It is flexible in your hands (contains rows of solid batteries inside). 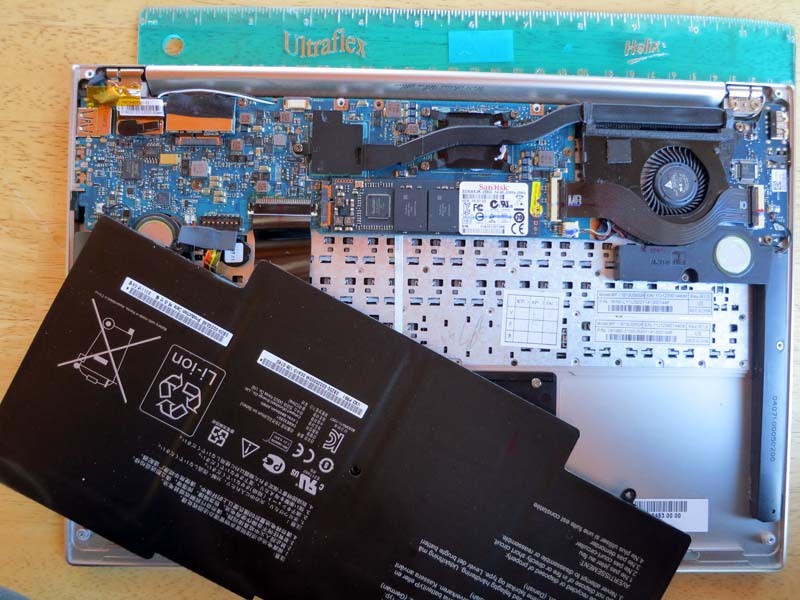 It says it is an ASUS Li-Polymer Battery Pack C22-UX31 Rating: +7.4V = 6840mAh, 50Wh. 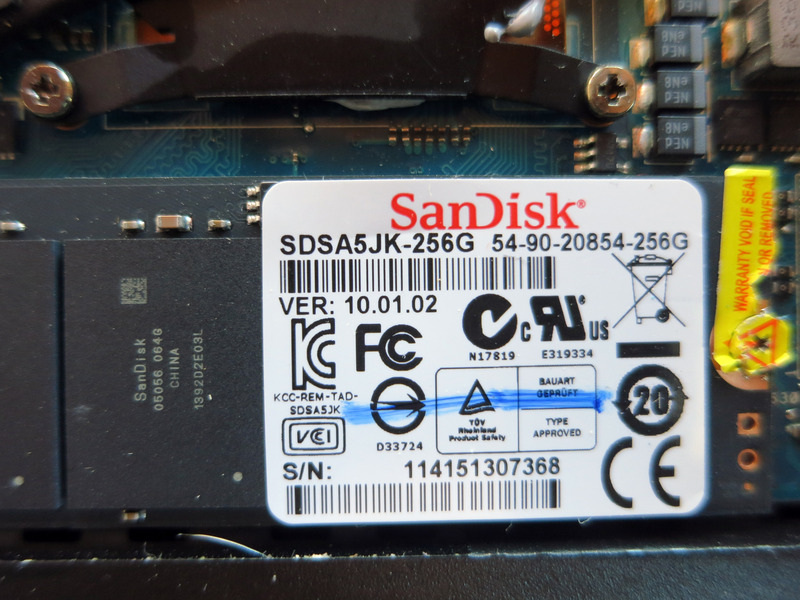 Here is a close-up picture of the SanDisk SDSA5JK-256GB SSD drive U100 SSD that comes inside the Asus UX31E-DH72 13.3 inch laptop. Super ultra closeup of the SanDisk 256 GByte SSD drive. Unsnap the two snaps and GENTLY lift the battery, it doesn't need any forcing and it is still attached by a small lead near the left middle of the laptop. Fully lifted, you can see the leads on the left center it is attached by, and you can see the keyboard and track pad fully exposed. 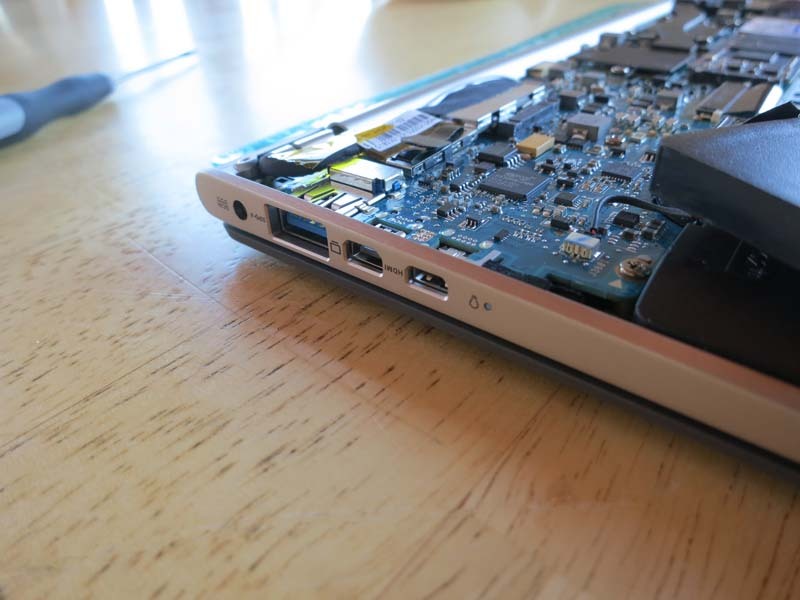 Here is a close up of the track pad logic boards on the ASUS UX31 Zenbook. 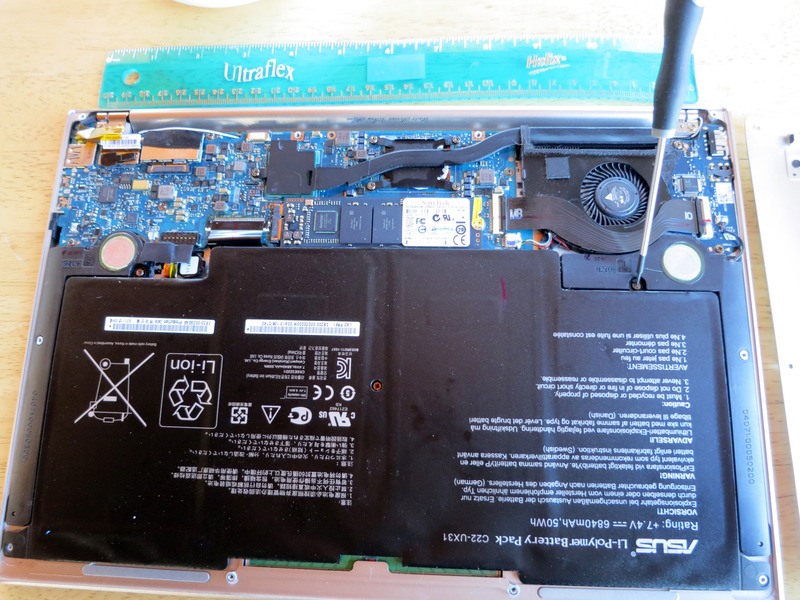 Dropping the battery back down but gently rotating it off to the side so you can clearly see the Intel i7 motherboard. This model (UX31E-DH72) contains the Intel Core i7-2677M running at 1.8 GHz with 13.3 inch display at 1,600x900 pixels with 4 GBytes of DDR3 RAM and a 256 GByte SSD drive. 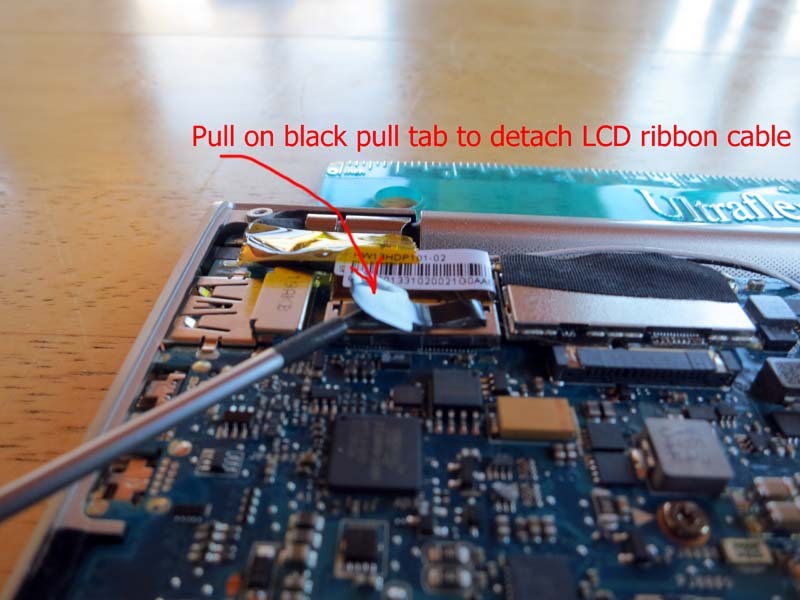 If you want to disconnect the monitor, you pull on the black pull tab piece of plastic in the upper left, the ribbon cable can be detached and reseated easily. Close up of the electrical tape on mysterious daughter board. On the outside of the ASUS UX31 Zenbook are some ports, below you can see the SD card port, the headphone jack, and the USB 2.0 port (there is USB 3.0 on the other side). On the edge of the ASUS UX31 you can see the micro HDMI port, mini VGA port, and the USB 3.0 port and finally the power jack (DC in).